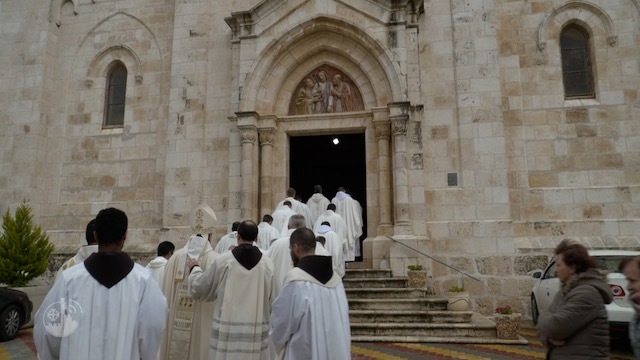 home / Multimedia / The Holy Land in news / Nazareth: a restoration project in the cave adjoining that of .. The Grotto of Conon is located alongside that of the Annunciation, inside the Church of the Annunciation. Here, following an earlier cleaning project that took place in 2010, a new project to study and restore a 4th-5th century fresco is now under way. The work is being carried out by two restorers from Rome, Tiziana dell’Omo and Lucia Di Paolo, coordinated by the University of Florence and the Franciscan architects of the Custody of the Holy Land. The cave in which the two restorers are working, which is smaller than that of the Annunciation and more mysterious in terms of how it was used, is of particular interest for the large number of inscriptions, both painted and graffiti, in its interior. Carved by pilgrims, they go back to the first centuries of the Christian era (probably to the 4th century) and testify to the antiquity of Christian worship at this Holy Place. The restoration is being carried out as part of the broader project entitled “Nazareth – Verbum caro hic factum est” supported by ATS pro Terra Sancta, which is aimed at preserving and enhancing this church as well as improving access for the many pilgrims who come to this Place.